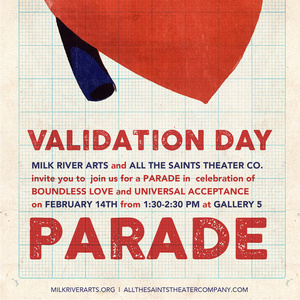 On February 14th, Richmond’s Gallery5 will be hosting a Validation Day Parade, organized by All the Saints Theater Company, Milk River Arts and Gallery5. This performance, which is free and open to the public, is designed to challenge and rethink how we celebrate love. It will feature banners, posters and prints made by Milk River Arts, music by members of Richmond’s, No BS Brass, a printmaking performance project by artist Barry O’Keefe, and costumes and massive puppets by All the Saints Theater Company. The event will begin at 1:30PM at Gallery 5, and wraps up at 2:30.